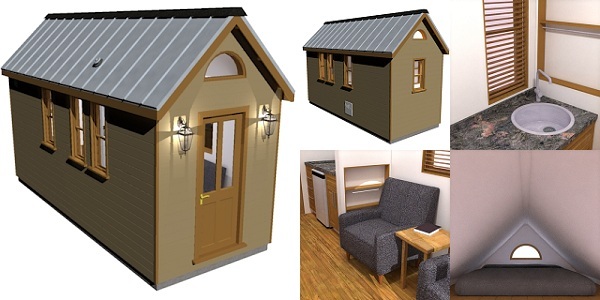 The Berneil is one of our mid-range sized tiny houses and contains storage space galore! With 5 recessed wall shelving units and two floor-to-ceiling closets, the Berneil is all about storage. The generous living area can double up as place to eat with an optional fold-able wall-mounted table and the kitchen is kitted with our standard set-up (cook-top, refrigerator, and sink), with one wall completely dedicated to storage with base and wall cabinets. The bathroom is accessed via a bi-fold door from the kitchen. It has enough space for all your sanitary needs with a toilet, shower, recessed shelving and an optional sink. It also has a large window to create a bright and spacious interior. As always, the loft is capable of accommodating a queen size mattress and is lit by a half-round window.